I was at Saks recently, and I got this great cotton long sleeve tee. It’s seriously the most comfortable material I’ve ever worn. And I love the print on it (It’s designed by Donna Karan!). Plus, it’s for a good cause, Key to the Cure. Learn more about Key to the Cure in the press release I posted below. I was pleasantly surprised when my Cincy Chic event planner, Libby, told me Saks wanted us to have a ladies night there to kick off the Key to the Cure campaign. Since I had just learned all about it, and thought it was fab, I was thrilled to help support the effort! Click here to check out info about the event Saks and Libby came up with! And click here to RSVP. 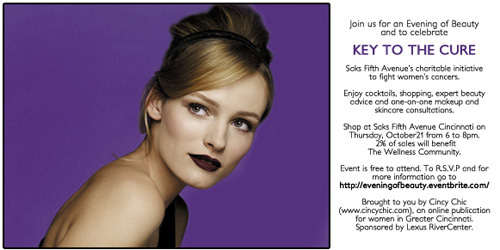 I hope you can attend this event to celebrate this Key to the Cure campaign with an “Evening of Beauty” on Oct. 21. Enjoy cocktails, shopping, expert beauty advice and one-on-one makeup and skincare consultations. A portion of the sales will go to the wellness community that the Key to the Cure campaign supports! Oh, and while you’re there, be sure you snag one of these shirts! CINCINNATI September 16, 2010 – To help raise both money and awareness for women’s cancers, Saks Fifth Avenue Cincinnati will partner with The Wellness Community of Greater Cincinnati and Northern Kentucky and host the 2010 Key To The Cure, a charity shopping weekend taking place Thursday, October 21 through Sunday, October 24. 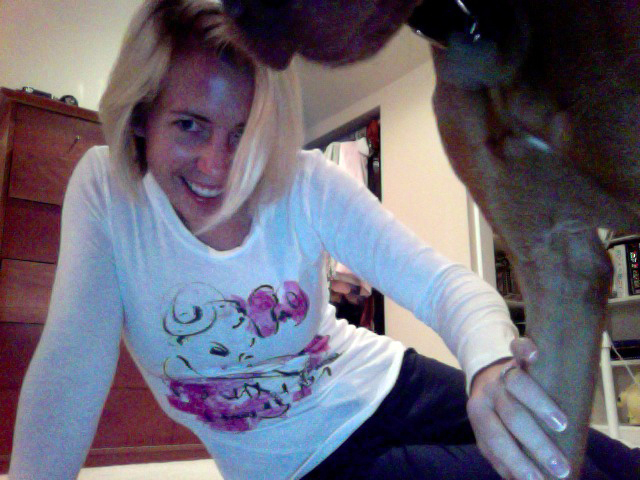 Trying to get a pic in my Key to the Cure shirt, but my dog kept getting in the way! haha! To launch this year’s event, Saks Fifth Avenue Cincinnati will host a Key To The Cure celebration on Saturday, October 23, from 12 – 3pm, featuring a personal appearance by acclaimed Italian jewelry designer Marco Bicego with hors d’oeuvres, entertainment and, of course, shopping. Saks will also offer a limited-edition Key To The Cure T-shirt designed by Donna Karan, available beginning Friday, October 1 and retailing for $35 in Saks stores, Saks Fifth Avenue OFF 5TH stores and on saks.com. 100% of the purchase price of each shirt sold will be donated to local charity partners. Actress Uma Thurman is the 2010 Ambassador for Saks Fifth Avenue’s Key To The Cure. In support of this program, Ms. Thurman will appear in a national public service announcement (PSA) wearing the Donna Karan limited-edition T-shirt. The Key To The Cure PSA will appear in major fashion and lifestyle magazines in September and October. Saks will donate 2% of sales Thursday to Sunday, October 21 to 24, up to $500,000, to local and national women’s cancer charities. Saks Fifth Avenue will also make a donation of $375,000 to The Breast Cancer Research Foundation. Saks Fifth Avenue initiated its charity shopping weekend in 1999. Since then, the company has donated over $33 million to women’s cancer research and treatment organizations throughout the United States. Organizations benefiting from these funds include: The Breast Cancer Research Foundation, Entertainment Industry Foundation’s Women’s Cancer Research Fund, Cleveland Clinic, Boston’s Dana-Farber Cancer Institute, Nevada Cancer Institute and many others.